After the Council of Chalcedon, the monophysite controversy (together with institutional, political, and growing nationalistic factors) led to a lasting schism between the Oriental Orthodox churches, on the one hand, and the Eastern Orthodox and Western churches on the other. The Christological conflict among monophysitism, dyophysitism, and their subtle combinations and derivatives lasted from the third through the eighth centuries and left its mark on all but the first two Ecumenical councils. The vast majority of Christians presently belong to the Chalcedonian churches, namely the Eastern Orthodox, Roman Catholic, and traditional Protestant churches (those that accept at least the first four Ecumenical Councils); these churches have always considered monophysitism to be heretical, usually claiming that it implies Christ is neither "truly God" nor "truly man". Monophysitism is occasionally referred to as "monophysiticism". Monophysitism was born in the Catechetical School of Alexandria, which began its Christological analysis with the (divine) eternal Son or word of God and sought to explain how this eternal word had become incarnate as a man—in contrast to the School of Antioch (birthplace of Nestorianism, the antithesis of monophysitism), which instead began with the (human) Jesus of the Gospels and sought to explain how this man had become united with the eternal word in the incarnation. Both sides agreed that Christ was both human and divine, but the Alexandrians emphasized divinity (including the fact that the divine nature was itself "impassible" or immune to suffering) while the Antiochines emphasized humanity (including the limited knowledge and "growth in wisdom" of the Christ of the Gospels). Individual monophysite and Nestorian theologians in fact rarely believed the extreme views that their respective opponents attributed to them (although some of their followers may have). Ultimately, however, the dialectic between the schools of Alexandria and Antioch produced Christologies that on all sides (notwithstanding ongoing differences between the Oriental Orthodox and Chalcedonian churches) avoided the extremes and reflect both points of view. Monophysitism was condemned by the Council of Chalcedon in 451, which among other things adopted the Chalcedonian Definition (often known as the "Chalcedonian Creed") stating that Christ is the eternal Son of God. [M]ade known in two natures without confusion [i.e. mixture], without change, without division, without separation, the difference of the natures being by no means removed because of the union, but the property of each nature being preserved and coalescing in one prosopon [person] and one hupostasis [subsistence]—not parted or divided into two prosopa [persons], but one and the same Son, only-begotten, divine Word, the Lord Jesus Christ. Accepted by the sees of Rome, Constantinople, and Antioch, the Chalcedonian settlement encountered strong resistance in Alexandria (and in Egypt generally), leading ultimately to the schism between the Oriental Orthodox churches (which reject Chalcedon), on the one hand, and the so-called Chalcedonian churches on the other. The Chalcedonian churches have always considered monophysitism to be heretical and have generally viewed it as the (explicit or implicit) position of Oriental Orthodoxy. Oriental Orthodoxy, however, considers their own Christology, known as miaphysitism and based heavily on the writings of Cyril of Alexandria (whom all sides accept as orthodox), to be distinct from monophysitism and often object to being labelled monophysites. 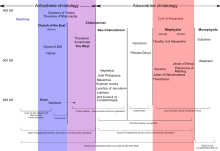 Christological spectrum c. 5th-7th centuries. Monophysitism is on far right (enlarge). Monophysitism, and its theological antithesis Nestorianism, were extensively disputed and divisive competing tenets in the maturing Christian traditions during the first half of the 5th century, during the tumultuous last decades of the Western Empire. It was marked by the political shift in all things to a center of gravity then located in the Eastern Roman Empire, and particularly in Syria, the Levant, and Anatolia, where monophysitism was popular among the people; neither positions were of particular debate in the West beyond Rome. Apollinarism or Apollinarianism holds that Christ had a human body and human "living principle" but that the Divine Logos had taken the place of the nous, or "thinking principle", analogous but not identical to what might be called a mind in the present day. Apollinarism was condemned as a heresy at the First Ecumenical Council of Constantinople in 381. Eutychianism, which has been considered an extreme form of monophysitism, holds that the human and divine natures of Christ were fused into one new single (mono) nature: His human nature was "dissolved like a drop of honey in the sea. "[a] Eutychianism was condemned at the Ecumenical Council of Chalcedon in 451. Eutychianism was also condemned at the non-chalcedonian Third Council of Ephesus in 475. "Moderate" Monophysites, while rejecting Eutychianism, also opposed the Chalcedonian Christology on accusations of seeming like Nestorianism. After Nestorianism was rejected at the First Council of Ephesus, Eutyches, an archimandrite at Constantinople, emerged with diametrically opposite views. Eutyches' energy and the imprudence with which he asserted his opinions brought him accusations of heresy in 448, leading to his excommunication. In 449, at the controversial "robber" Second Council of Ephesus, Eutyches was reinstated and his chief opponents Eusebius, Domnus and Flavian were deposed. Monophysitism and Eutyches were again rejected at the Council of Chalcedon in 451. Eutyches was again condemned at the non-Chalcedonian Third Council of Ephesus in 475. Later, monothelitism – the belief that Christ was two natures in one person except that he only had a divine will and no human will, or at least had one will in general – was developed as an attempt to bridge the gap between the monophysite and the Chalcedonian position. However, it too was rejected by the members of the Chalcedonian synod, despite at times having the support of the Byzantine emperors and once escaping the condemnation of a pope of Rome, Honorius I. Some[who?] are of the opinion that monothelitism was at one time held by the Maronites; the contemporary Maronite community mostly disputes this, stating that they have never been out of official communion with the Roman Catholic Church. ^ Other many variants of the analogy use terms like "vinegar", "ink", "blood" and such robust liquids that would be totally masked in the expanse of an ocean. "Sea" is also traded for "glass of water" for examples that would emphasize a new product "neither [liquid] nor water", for a unique single "third nature" of Christ. ^ a b Grudem, Wayne A. (2014-10-28). Bible Doctrine: Essential Teachings of the Christian Faith. Zondervan Academic. ISBN 9780310515876. ^ Quoted in Kelly 1977, p. 340 (bracketed language added). ^ Metropolitan Bishoy of Damitte – Egypt. "Interpretation of the Christological Official Agreements between the Orthodox Church and the Oriental Orthodox Churches" (DOC). Retrieved 30 December 2011. ^ a b c d Newman, John Henry (2011-03-31). John Henry Newman Sermons 1824-1843: Volume IV: The Church and Miscellaneous Sermons at St Mary's and Littlemore. OUP Oxford. ISBN 9780199200917. Chesnut, R.C., Three Monophysite Christologies, 1976 (Oxford). Frend, W.H.C., The Rise of the Monophysite Movement, 1972 (Cambridge).